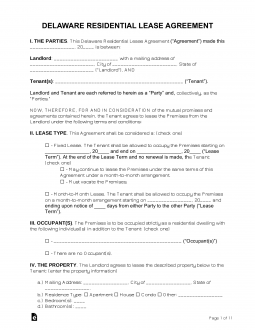 The Delaware rental agreements are contracts used by landlords when allowing a tenant to occupy and use property for a period of time in return for rent. When written, the documents must follow all State laws (Residential Title 25 and Commercial Article 25, Chapter 61). The form becomes legally binding after all parties have signed. Rental Application – Not required but recommended for a landlord to use to ensure that the person that will be renting their property is qualified. Commercial Lease Agreement – For the sole use of property to be used by a business. May be for any type of commercial property including: office, industrial, and retail. Lease to Own (Option to Purchase) Agreement – Simple lease with the added benefit of having the option to buy the property during the term. Month-to-Month Rental Agreement – Known as a tenancy at will with no end date and either party, landlord or tenant, at any time has the option to cancel. Roommate Rental Agreement – For the use of more than one (1) individual seeking for a shared living arrangement. Standard Residential Agreement – Standard fixed version for term usually amounting to twelve (12) months. SubLease Agreement – A lessee enters an agreement with a sub-tenant to take-over the premises until a specific date or when the master lease expires. Termination Rental Letter (Title 25 § 5106) – Landlord or tenant has the right to cancel a monthly rental contract with at least sixty (60) days written notice. Landlord-Tenant Code (Title 25 § 5118) – Landlord must give a copy of the Landlord-Tenant Code to the Tenant. Owner/Agent Disclosure (Title 25 § 5105) – Owner/Agent must include information in the rental document as to who owns the residence. (Title 25 § 5509) Landlord must allow for forty-eight (48) hours notice to the tenant before entering the premises. Maximum (Title 25 § 5514) – Equal to one (1) month for yearly agreements and may be any amount (no cap) as determined by the landlord for a month-to-month lease (Tenancy at Will). Returning (Title 25 § 5514) – Landlord must return the funds, along with any deductions which much be listed in an itemized statement, within twenty (20) days.